Slice a lid approx. 2 cm thick off the top of the loaf. Carefully remove the bread from the inside, cut into cubes. Mix the bread cubes with the oil and garlic, spread onto a baking tray lined with baking paper. Bake the bread cubes for approx. 10 mins. in the centre of an oven preheated to 180°C. Place the bread bowl and lid in the oven and bake alongside the bread cubes for the final 5 mins. Rub the garlic around the fondue pot, place the cheese in the pan. Mix the wine with the cornflour and pour into the pot. Simmer the cheese over a low heat, stirring constantly until a creamy texture is achieved. Add the Kirsch, season. 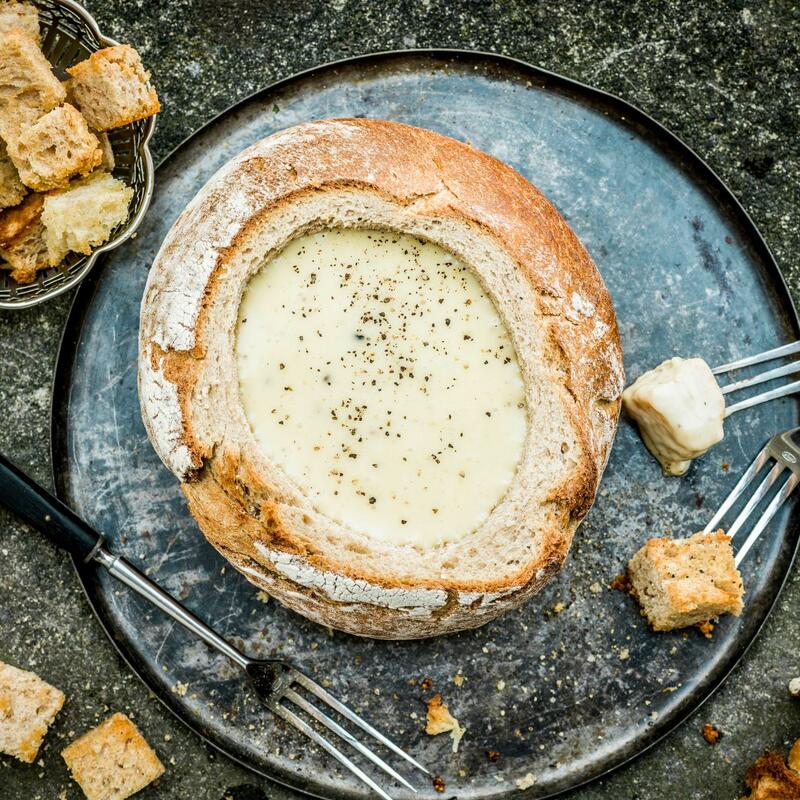 Pour the fondue into the bread bowl, dunk the croutons in the cheese. Allow approx. 200 g of cheese per person. The type of cheese you use is a matter of taste. Vacherin creates a creamy fondue, Gruyère is aromatic and creamy once melted, however Appenzeller and Sbrinz will also add flavour to a fondue. As a general rule of thumb, you should use half as much wine as cheese. Instead of wine, you can also use apple juice, beer or another suitable liquid. When adding the cornflour, use 1 tsp per 200 g of cheese. And when it comes to the Kirsch, you can add anything from a drop to a good glug. Replacing the Kirsch with gin or whisky will give the fondue a special, innovative twist.